On July 4 at 9 a.m. in Geneva (3 a.m. in New York), officials at the Large Hadron Collider outside Geneva, Switzerland are expected to present new results on, and possibly the discovery of, the Higgs boson, the final missing piece of the Standard Model of physics, which explains the interactions between all known subatomic particles and forces, and is required to give all other particles their mass. Its discovery would further validate the Standard Model as essentially correct, as it is the only elementary particle predicted by the Standard Model that has not yet been observed in particle physics experiments. If the results of the work at CERN can not show that the Higgs boson exists, much of our entire understanding of physics will need to be re-written. Tevatron at Fermilab in Illinois announced their latest data on July 2, which gives more strong evidence for the existence of the Higgs. "It is a real cliffhanger," said DZero co-spokesperson Gregorio Bernardi, physicist at the Laboratory of Nuclear and High Energy Physics, or LPNHE, at the University of Paris VI & VII. "We know exactly what signal we are looking for in our data, and we see strong indications of the production and decay of Higgs bosons in a crucial decay mode with a pair of bottom quarks, which is difficult to observe at the LHC. We are very excited about it." DZero is an international experiment conducted by 446 physicists from 82 institutions in 18 countries. The mass of the Higgs boson itself is still a mystery, though the new Tevatron data corroborate earlier results from both the Tevatron and the LHC that place the Higgs between 115 and 135 gigaelectron volts (GeV), or roughly 115 to 135 times heavier than a proton. The new Tevatron data are 2.9-sigma — a relatively low significance but, because they support the LHC results, they place even greater confidence in the signal being a true indication of the Higgs. The Tevatron sees the Higgs decay in particular ways that the LHC isn’t sensitive to, meaning it could clarify certain properties of the Higgs that the LHC may struggle with. After more than 10 years of gathering and analyzing data produced by the U.S. Department of Energy’s Tevatron collider, scientists from the CDF and DZero collaborations have found their strongest indication to date for the long-sought Higgs particle. Squeezing the last bit of information out of 500 trillion collisions produced by the Tevatron for each experiment since March 2001, the final analysis of the data does not settle the question of whether the Higgs particle exists, but gets closer to an answer. The Tevatron scientists unveiled their latest results on J uly 2, two days before the highly anticipated announcement of the latest Higgs-search results from the Large Hadron Collider in Europe. "The Tevatron experiments accomplished the goals that we had set with this data sample," said Fermilab’s Rob Roser, cospokesperson for the CDF experiment at DOE’s Fermi National Accelerator Laboratory. "Our data strongly point toward the existence of the Higgs boson, but it will take results from the experiments at the Large Hadron Collider in Europe to establish a discovery." The Higgs particle is named after Scottish physicist Peter Higgs, who among other physicists in the 1960s helped develop the theoretical model that explains why some particles have mass and others don’t, a major step toward understanding the origin of mass. The model predicts the existence of a new particle, which has eluded experimental detection ever since. Only high-energy particle colliders such as the Tevatron, which was shut down in September 2011, and the Large Hadron Collider, which produced its first collisions in November 2009, have the chance to produce the Higgs particle. About 1,700 scientists from U.S. institutions, including Fermilab, are working on the LHC experiments. The Tevatron results indicate that the Higgs particle, if it exists, has a mass between 115 and 135 GeV/c^2, or about 130 times the mass of the proton. 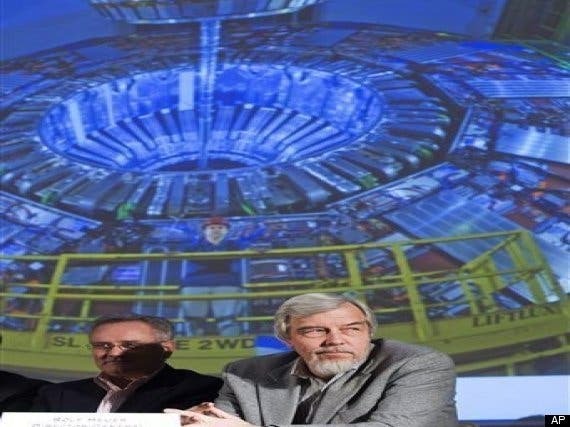 "During its life, the Tevatron must have produced thousands of Higgs particles, if they actually exist, and it's up to us to try to find them in the data we have collected," said Luciano Ristori, co-spokesperson of the CDF experiment (CDF is an international experiment of 430 physicists from 58 institutions in 15 countries) and physicist at Fermilab and the Italian Istituto Nazionale di Fisica Nucleare (INFN). "We have developed sophisticated simulation and analysis programs to identify Higgs-like patterns. Still, it is easier to look for a friend’s face in a sports stadium filled with 100,000 people than to search for a Higgs-like event among trillions of collisions. "* The final Tevatron results corroborate the Higgs search results t hat scientists from the Tevatron and the LHC presented at physics conferences in March 2012. "We achieved a critical step in the search for the Higgs boson," said Dmitri Denisov, DZero cospokesperson and physicist at Fermilab. "While 5-sigma significance is required for a discovery, it seems unlikely that the Tevatron collisions mimicked a Higgs signal. Nobody expected the Tevatron to get this far when it was built in the 1980s."